Home » Autograph » Autograph 1933 Sütterlin script, Latin alphabet. Autograph 1933 Sütterlin script, Latin alphabet. 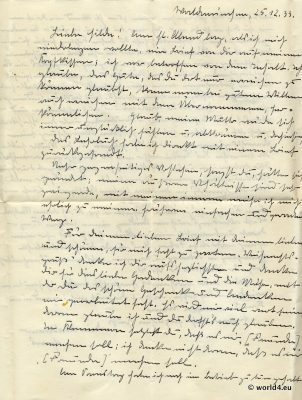 Letter in old German Sütterlin handwriting. In addition to the German Sütterlin script, which is a special form of the German Kurrentschrift, Ludwig Sütterlin also developed a stylistically comparable Latin script. It had become fashionable in England in the 19th century to write with the newly developed steel nib. The very angled English script with its large ascenders and ascenders and its variable stroke (swelling) is decorative, but technically difficult to write. At that time, similar typefaces with German letterforms were written in Germany. To make it easier for the children to learn to write, Sütterlin simplified the letter forms, reduced the ascenders and descenders (lineature in a ratio of 1:1:1), uprighted the relatively wide letters and had them written in parallel with a ball point pen. In all of these features, it is similar to today’s antique-based school fonts. The German Sütterlin inscription was introduced in 1915 in Prussia. It began in the 1920s to replace the formerly customary form of German curriculum writing, and in 1935 it became part of the official curriculum in a modified form (slightly slanted position, fewer round forms) than the German People’s Scripture. 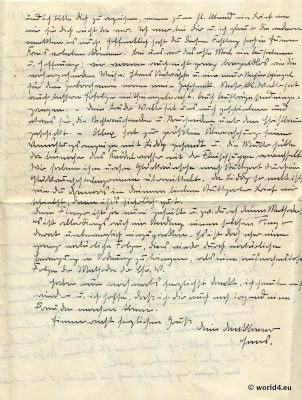 However, as a consequence of the Ordinary Letter Decree, it was also banned in a circular of 1 September 1941, after Martin Bormann (Chairman of the NSDAP) had already issued a circular of 3 January 1941 prohibiting the use of broken printed matter (fracture types). Previous PostIllustration of Rococo fashion costumes, Postcard from 1900.